Football agents have told Fifa they do not want an income cap but would welcome more regulation as part of new transfer proposals. More than 120 agents met Fifa, Uefa and Football Association officials last week to discuss plans to address Fifa’s concerns about money “flowing out of the football industry”. “If everyone in football was capped, it would make sense,” said Mike Miller of the Association of Football Agents. Premier League clubs paid agents £211m in the past year, an increase of £37m. Fifa has set up a taskforce, which met on Monday to discuss new proposals, after president Gianni Infantino said he was “very concerned about the huge amount of money that is flowing out of the football industry”. 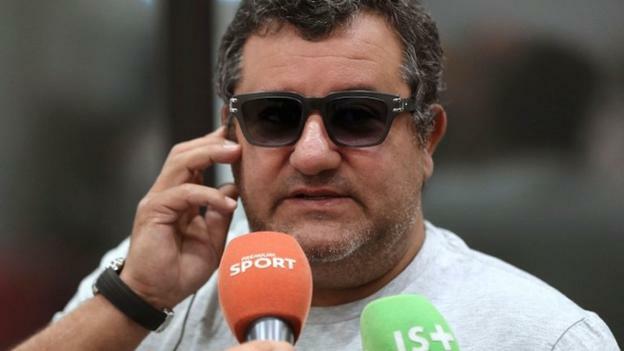 It follows claims that Paul Pogba’s agent Mino Raiola is reported to have earned £23m from the French midfielder’s £89m move from Juventus to Manchester United in 2016. There have been discussions about limiting an agent’s fee to 3%, with the current average 6.7%, and even limiting the number of transactions a club can sanction in the January transfer window. Independent AFA chairman Miller, who attended the meeting in north London last Wednesday, told BBC Sport: “The fact they came over from Switzerland was a big statement. “Talk to most agents and they will say they are not paid enough. Often fees have to be shared around. “To get a licence across Europe, you need to register in each country and if you use a local agent that’s half your fee gone. The family can take part of the fee too. Agents are not properly rewarded for the time and effort they put in. At the meeting, Fifa officials also spoke to agents about better regulation of their industry and whether an agent can represent more than one party in a negotiation. Miller said agents would welcome more structure after Fifa’s decision in 2015 to de-regulate the industry and that in some cases, representing more than one side to a negotiation was favourable to clubs and players because it can “speed things up and save money”. “We told Fifa that [de-regulation] was a mistake, and it seems they have finally realised this,” Miller added. “Everyone wants a level playing field and a code of conduct so that if it is broken there are sanctions for it. Any new regulation is not expected to come into force until October.